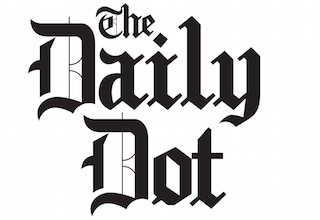 The Daily Dot, a site dedicated to Internet culture, has revamped its look. The new Dailydot.com is cleaner and features larger images. Stories are arranged in large blocks, making navigation quick and easy. As part of the redesign, Daily Dot has renamed its sections to “pay homage to digital culture.” We honestly don’t understand most of them, but that’s probably because we’re old. Below is the complete list of the new sections, along with Daily Dot’s description of each. Unclick (formerly LOL): A viral vortex of the dankest memes, savage roasts, and all the other ephemera of the Web. IRL (formerly Lifestyle): Where your off- and online identities collide. Upstream (formerly Entertainment): Tomorrow’s entertainment, today. Layer 8 (formerly Politics): Referring to Layer 8, the “political” layer of OSI networks, the section covers the intersection of the state and the Internet. Via (formerly Opinion): Thought leadership on the most important issues of the Internet generation shared via an abundance of web sources. Parsec (formerly Geek): A nod to Star Trek’s unit of measurement, Parsec goes traveling through the geek space to bring you stories that matter. Dot Esports: The best Esports coverage online. The Kernel: The Daily Dot’s Sunday magazine, bringing you stories about the Internet, technology, and life in this confusing thing called the modern world.